HP TouchPad @ $99 – Value? Confession: I enjoy talking about “value” because sometimes, it’s counter-intuitive. For example: how can an expensive solution or product be a better value than an inexpensive solution or product? So the 16 GB HP TouchPad went from $499 on July 1 to $399 in early August to $99 this weekend. 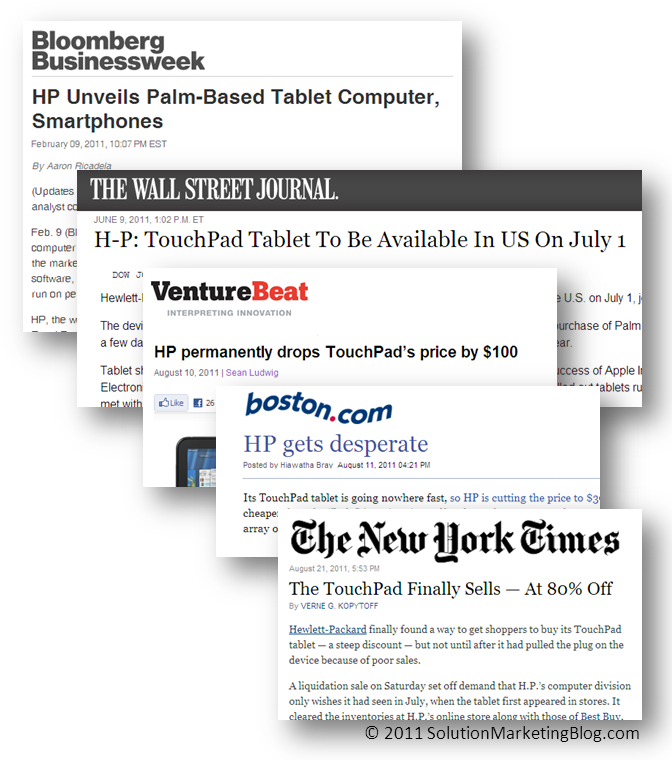 So, was the HP TouchPad a good value way back in July at $499? No. Poorer performance than an Apple iPad and lacked some of the iPad’s features. Or maybe it just lacked the features that users cared about, which is what value is really all about. Was the HP TouchPad a good value at $399 2 weeks ago? Still no. Still same slow performance. And did I mention that it had only around 320 apps (yeah, many others available but in small format)? And at $399, even if it was a good value for consumers, it was a bad deal for HP because they were losing money on each unit shipped. Which is why they decided to close down the TouchPad business in late August. Is the HP TouchPad a good value at $99? Maybe… not. Sure, at this price it’s got a lower price/benefit ratio than most other devices. But it’s not going to be very useful with such a dearth of apps. And as of now, it’s unlikely that anyone’s going to develop more apps anytime soon. How much customers are willing to pay for capabilities (speed, size – heck, even cameras) they want. When a product or solution lacks those capabilities, customers aren’t willing to pay. Customers will pay for value. And that’s why they weren’t willing to pay full price for a half-featured HP TouchPad. The Solution Marketing Blog: Apple iPad: Tablet or Solution?